The El Dorado Seaside Suites is an intimate, relaxed boutique resort in the beautiful Mexican Riviera! The adults-only all-inclusive gourmet dining El Dorado Seaside Suites is a quiet, romantic getaway designed especially for the two of you, from the resort’s beautiful local craftsmanship and superb service, to Nature’s dreamy blue skies, clear waters, and the incomparable silky white beaches that create the ideal destination for relaxation and romance. The resort is located on the secluded beach of Kantenah. 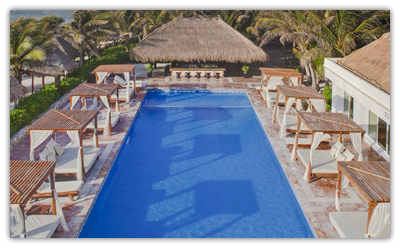 It is an hour south of Cancun International Airport and 25 minutes south of Playa del Carmen. It’s in a great location with the natural aquarium of Xel-Ha 10 minutes to the south, Eco park Xcaret 20 minutes to the north, Tulum only 25 minutes away, and the resort is next door to the Puerto Aventuras Golf club. The El Dorado Seaside Suites features many types of accommodations. The Spa at El Dorado Seaside Suites is a full-featured spa, providing dozens of holistic and natural treatments, blending the ancient Mayan health recipes with current know how. Facilities include three swimming pools, an outdoor Jacuzzi, tennis courts, bicycles, pier with facilities for yachts, complimentary access to a fitness facility, and a library with computers and wireless internet access. Seven restaurants, eight bars, 24-hour room service, daily yoga, Pilates, and aquafit programs add to the offering. Wedding services are available, as are two meeting rooms for private events. Accommodations include Jacuzzi Junior Suites, Luxury Jacuzzi Junior Suites, Beachfront Jacuzzi Junior Suites, Swim Up Jacuzzi Junior Suites, Royale Suites, Royale Swim Up Suites, Presidential Studios, Premium Jacuzzi Junior Suites, and Premium Swim Up Jacuzzi Junior Suites. All suites feature luxury amenities including king size or two double beds, marble and tile floors, satellite TV, DVD player, minibar, safety deposit box, and a terrace or balcony. 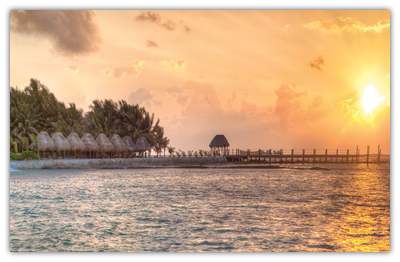 Signature Gourmet Inclusive concept is what you will enjoy here. There are many options, and all restaurants serve a la Carte only. Enjoy a wide variety of cuisine including international, Latin fusion, authentic Mexican, contemporary Italian, and Asian fusion. The bars located throughout the resort feature swings and swinging beach beds, swim-up locations, live music, and more. 24 hour room service is also available if you choose to dine in the privacy and comfort of your suite.